Architects and designers are quite challenged when it comes to working with a yacht since this offers them strict constraints when it comes to the overall vessel buoyancy. Hence, their vision should not just be left alone with structure, innovative design, presentation and comfort, which clients have required. 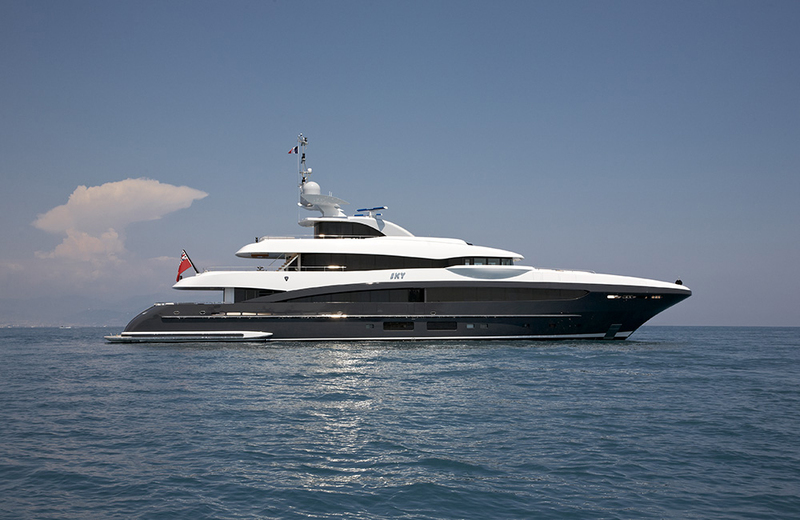 Together with the latest technology, carbon fiber is incorporated in this state of the art yacht design. Quality materials were exceptionally handpicked for the yacht interior decorations with outdoor textiles employed in it as per client’s demand to have a calming, clean, white aesthetic but otherwise securing durability and permanence intact. Each main deck’s wall is finished with hand selected Macassar Ebony with a high lacquer texture while the floors are carpeted with silk. 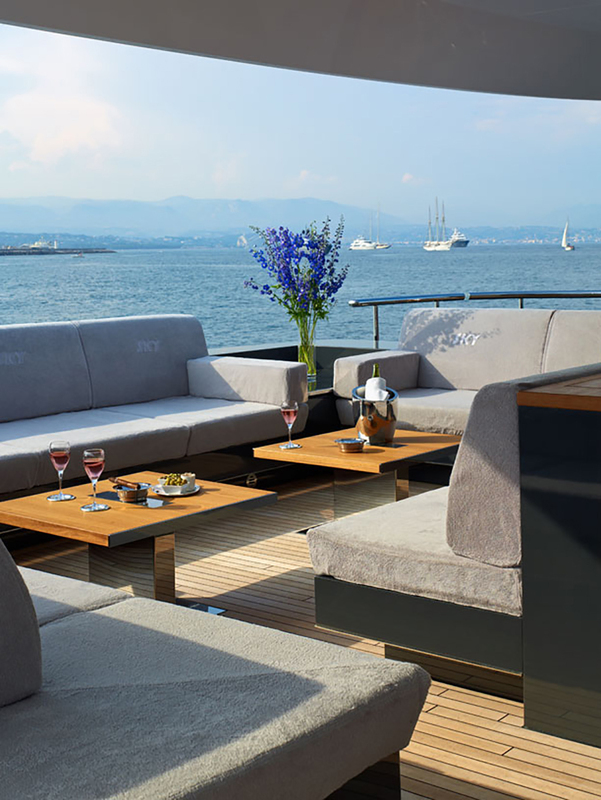 Additionally, all custom designed furnishings and accessories were made in the old country to keep the vessel’s European heritage. 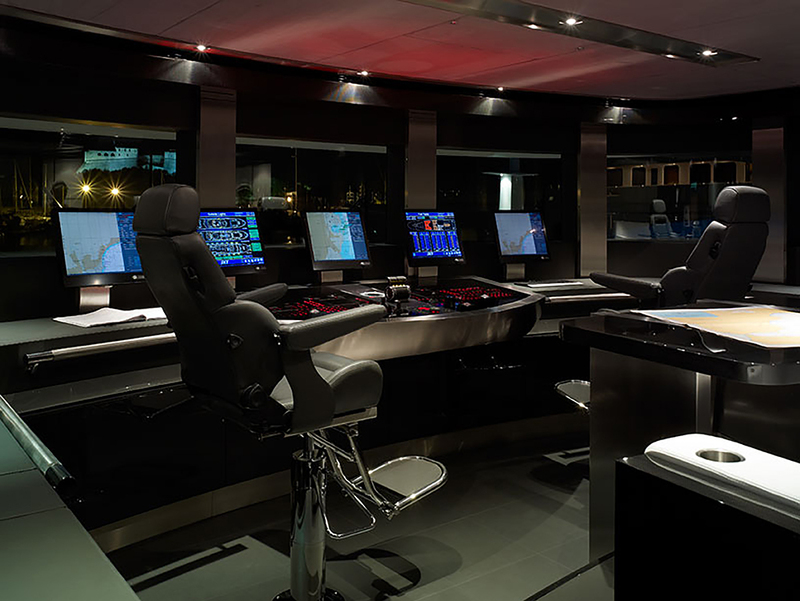 The expense for this yacht project was generously dispensed as the client wanted to ensure that their crew has the most advance technology at hand. Thus, every part of the ship was touched up thoroughly and with care. “Passion as the driving force behind the performance and perfection they deliver. 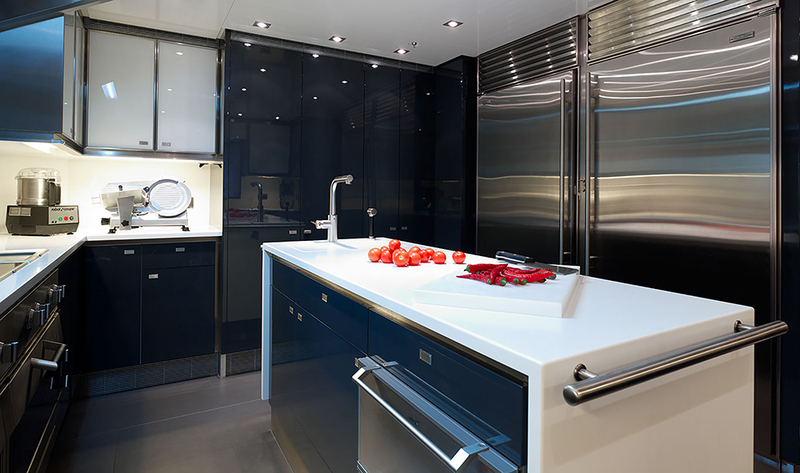 They strive for perfection both technically and aesthetically.” This has been the European boat manufacturers’ remark throughout their history, which made this project the yacht’s designers and architects’ their crowning glory. 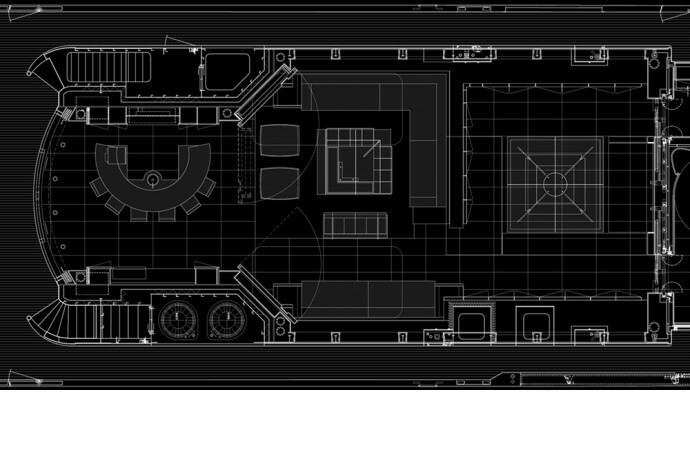 This is the overall illustration of the yacht’s open floor plan, where interior is intact with furnishings in an open concept. 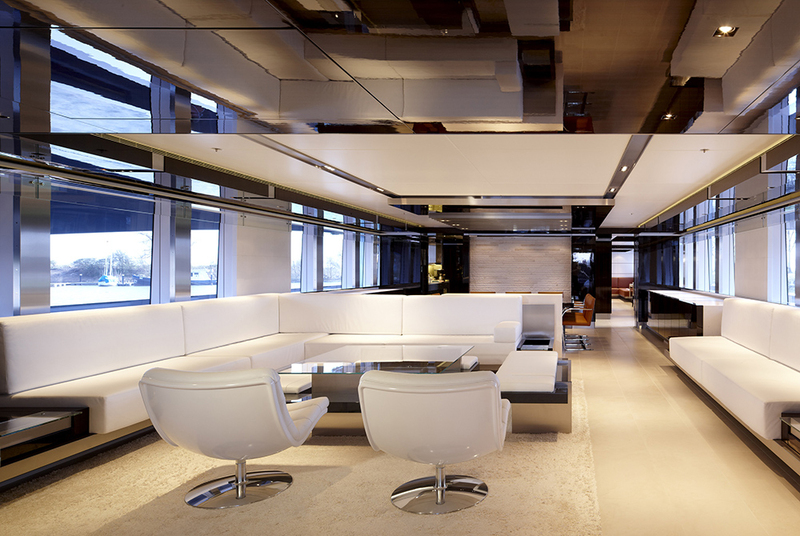 A living area with silk floor rug, glass center table, white swivel chairs and pure white leather corner benches. The bench itself serves as the space divider since this interior is an open concept. Zebra like patterns on the floor rug is enticing, giving the minimalist design slight details. No ornamentation other than that are added so that the focus within the contemporary look concentrates on geometrical figures starting from the glass center tables and arched white and cream sofa. There is also a combination of matte and glossy surfaces, which can be seen on the flooring and ceiling. An owner’s studio employed with leather covered sofa embracing the corner of the walling and a cream colored chair with a wood and glass top office desk. Macassar ebony touched book shelves are also installed on the wall with additional space provided by white cabinet underneath. Glowing and reflective ceiling and surface dominates this owner’s suite with a rug covered floor and wall and ceiling surfaces gleaming in black Macassar ebony touch. A working counter with white leather chair is provided in the corner with a black cabinet for storage. Also, a wide screen TV is mounted on the wall for entertainment. The bathroom is overviewing the suite. Inside is a unique and fab leather and glass bath tub and gleaming surfaces starting from the door and counter steel outlines, extra wide mirrors and bright lighted ceiling. 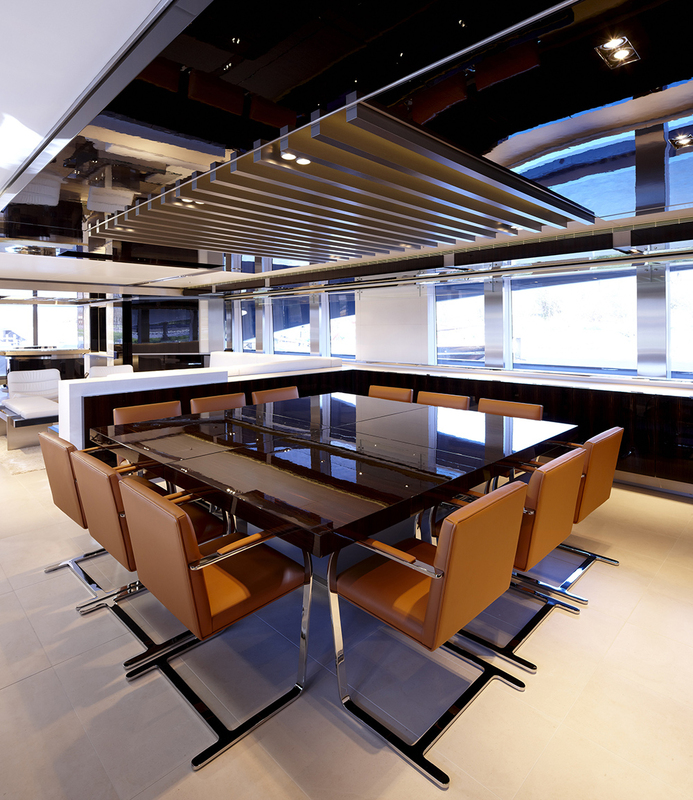 Large square polished dining table surrounded with eccentric leather designed dining chairs. The table seats a total of 12 ochre tone leather dining chairs with steel foot and arm support. The smooth sanded flooring contrasts the gleaming and reflective ceiling. This is the guest cabin accommodating two beds. Finished with glowing and reflective wood Macassar ebony, leather outlining bed headboard and bottom. Adjacent to this is a bathroom with under sink and complete bathroom fixtures. A black shaded steel kitchen with complete set of cook wares and tools. 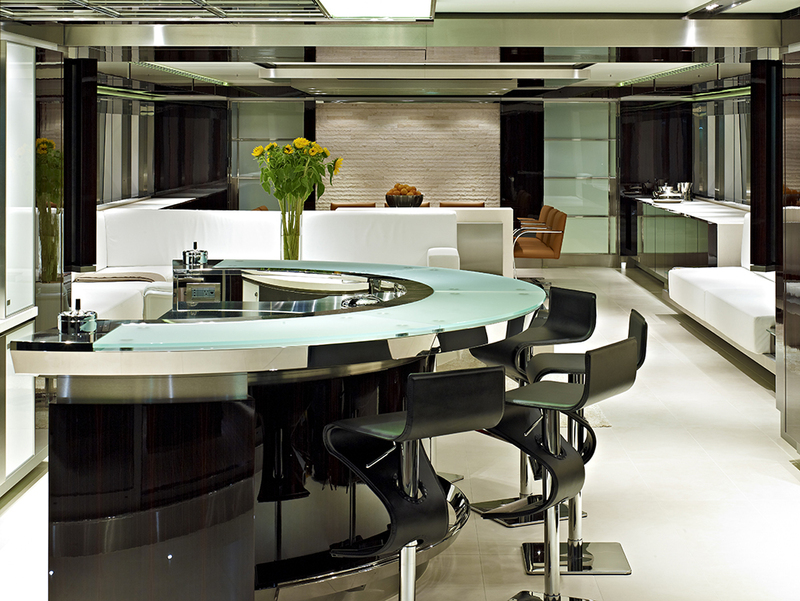 Glowing with the lights, the glossy surfaces in this area are contrasted with the matte finish flooring. The white granite counter is installed with a conventional oven behind. 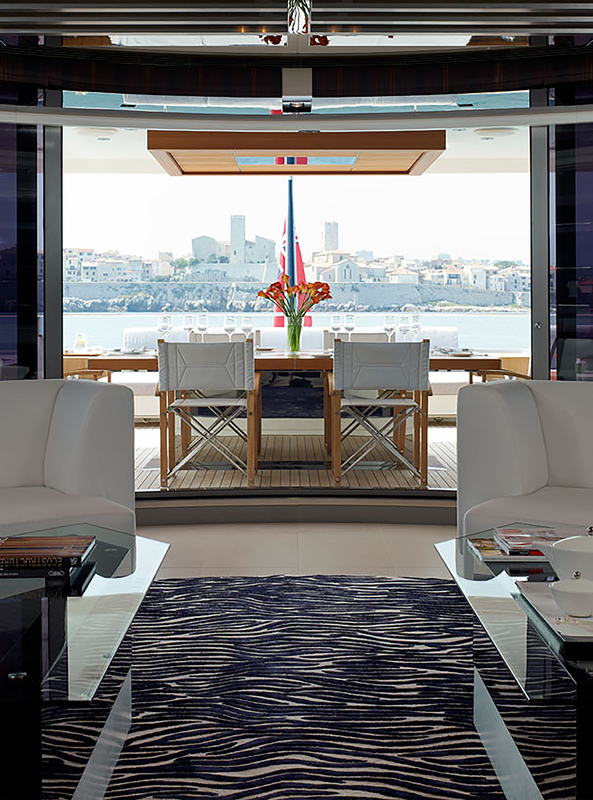 Another star of this yacht’s interior is the ergonomic bar area with customized glass table in arched form. While the black leather bar stools are classy and chic, the white leather sofa itself serves as the divider between the living and bar area. The rough limestone texture provides a rugged look of the dining area. Adjacent to the living area is an open porch with a cool and breezy view of the waters. The porch is composed of wooden plank elevation that sits four chairs and a glass table on it. On the interior rests an artsy floor rug printed in zebra prints. Geometry composed this area with lighted ceiling outlined with gleaming steels. The steel post support on the staircase glows with the steps steel outlines and hand railing. 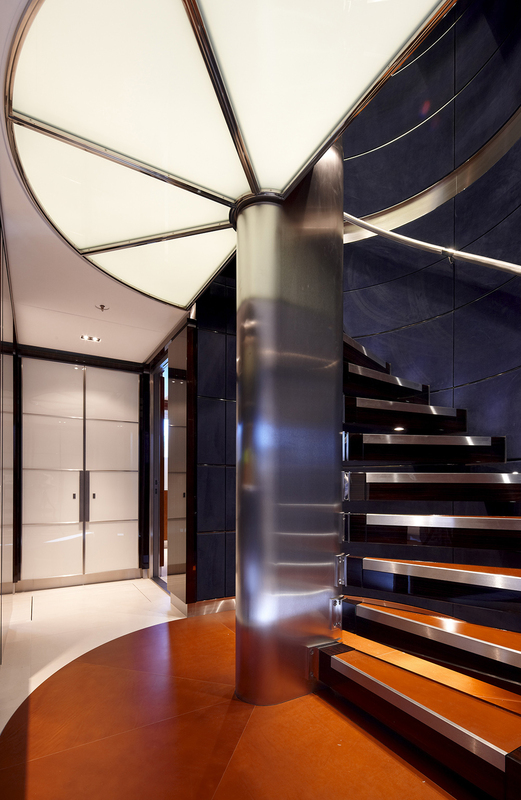 While matte finish flooring and steps’ surface contrast the glowing effect. 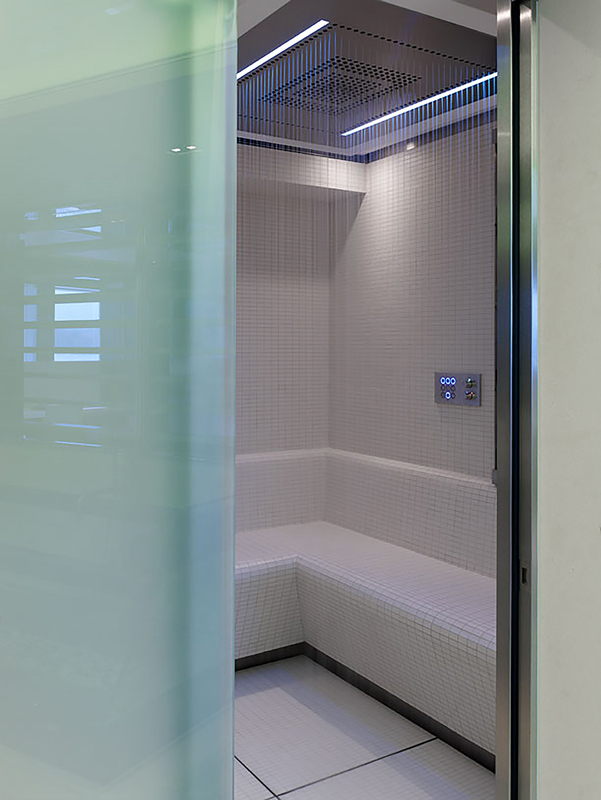 Hot and cold rain shower with pure white mosaic bath room wall bench and wall. The floor is covered with wide scale white tiles. 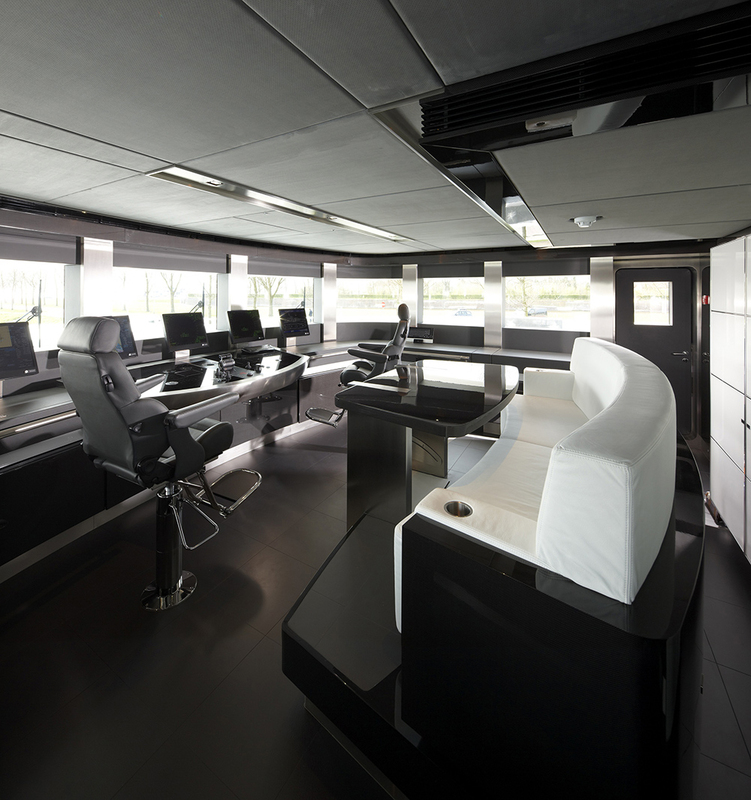 This is the command bridge secured with high tech equipment and ergonomic furnishing like the soft white leather sofa with black glossy desk. 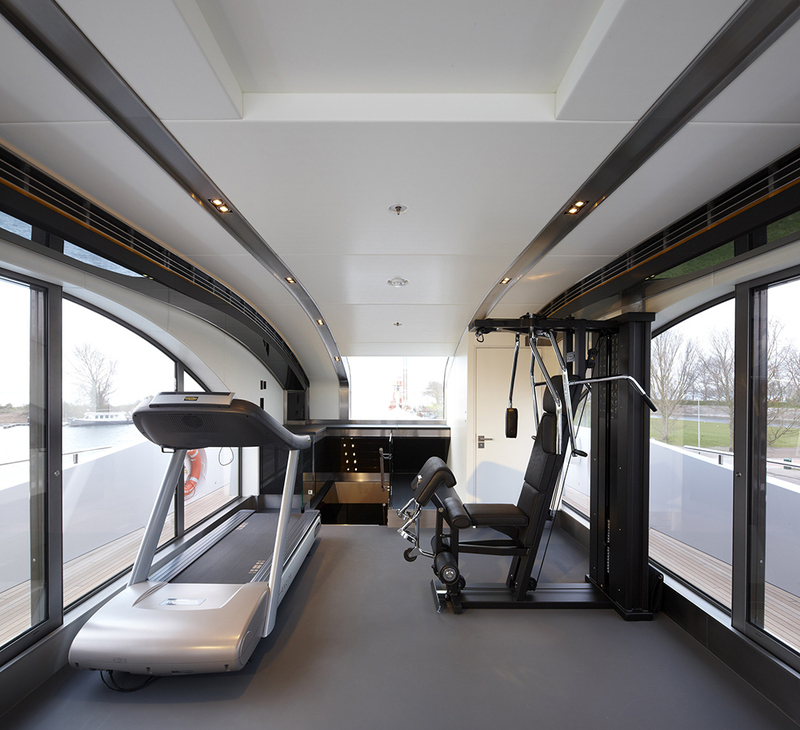 This is the technogym with sets of high tech gym equipment like the thread mill. The flooring is a smooth grey colored finish while the glass walls provide natural lighting as well as an open view of the outside. 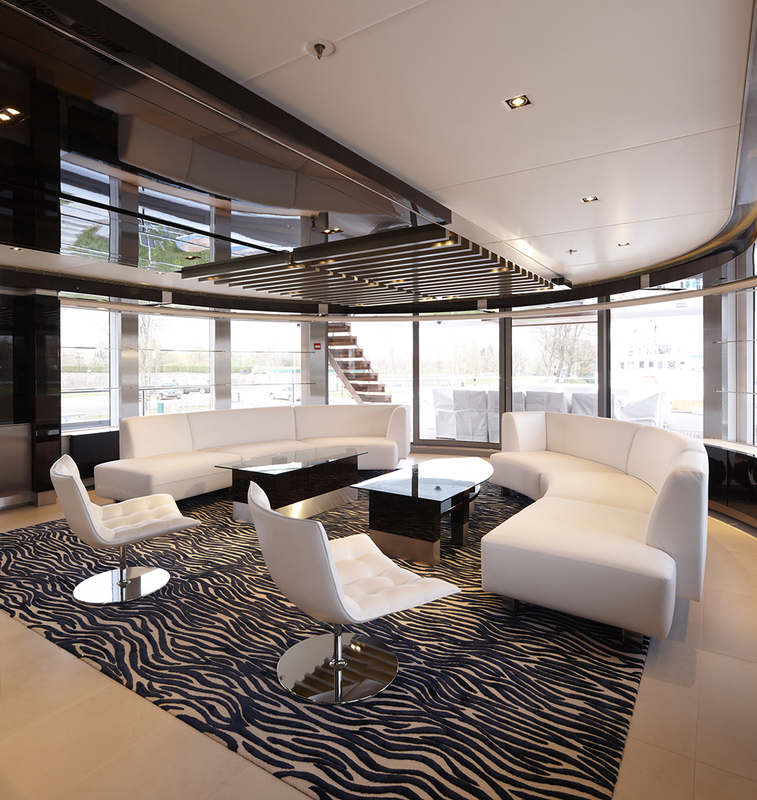 This one is located on the yacht’s sun deck. The operation bridge running in night time is provided with good lighting. The outside view of the suite and coast is seen through the wide glass windows. This is the open space patio designed with wood flooring and tables. Around it are the cushioned grey sofa. By having these, you can freely enjoy a glass of wine while savoring the coolness and stillness of the ocean. 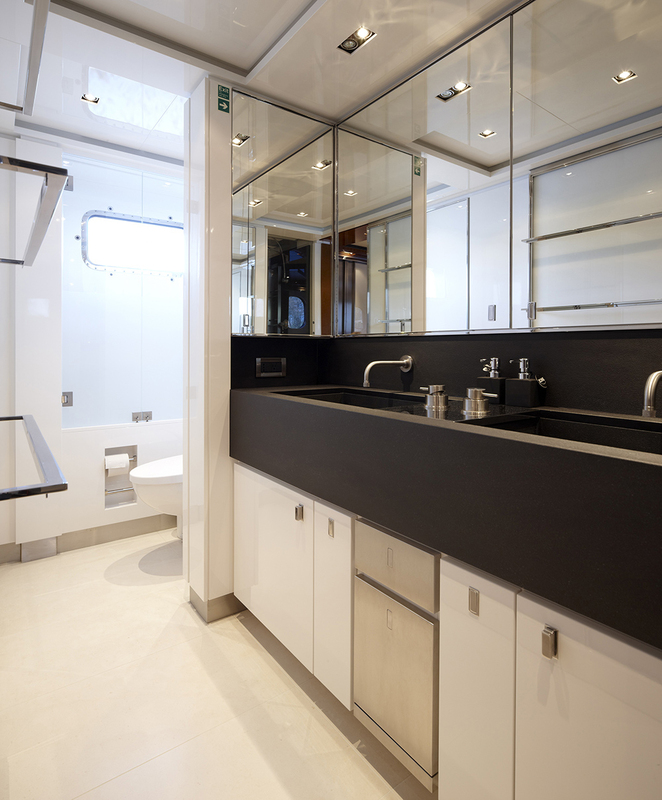 The classy and chic bathroom with cream and white tone contrasted with black sink counter. 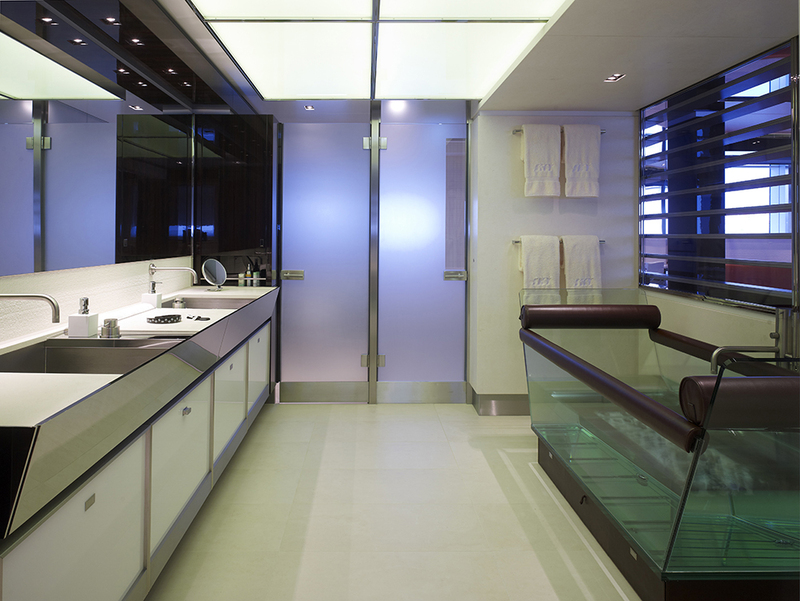 This bathroom is designed with enough lighting and extra mirrors for added glow.